Flavorful shredded pork! Great with rice, in a lettuce wrap, or simply by itself! Add the pork tenderloin to the electric pressure cooker insert with the hot water. Add the thin onion slices on top. Pour the teriyaki sauce onto the pork tenderloin and onion slices. Add the minced garlic and crushed red pepper flakes over the top. Sprinkle salt and pepper to taste. Remove tenderloin and let sit for 5 minutes before slicing. Spoon sauce over sliced pork pieces. 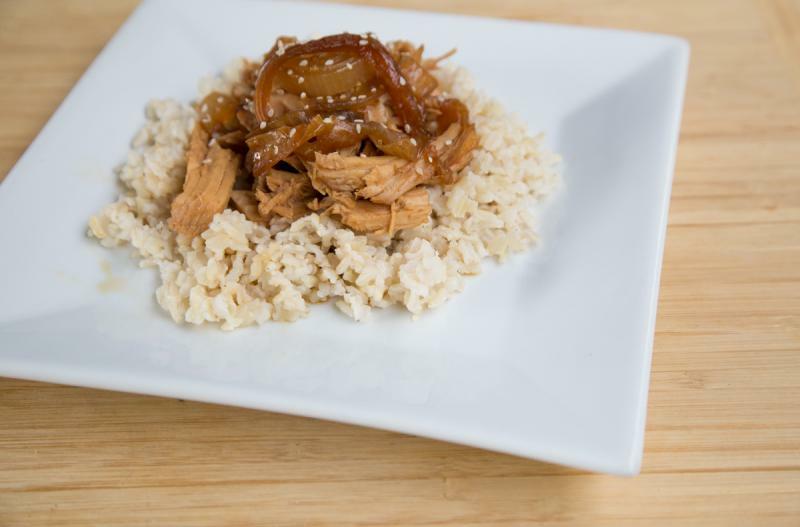 Serve Instant Pot Teriyaki Pork Tenderloin with sliced green onions garnish, rice and veggies. Thaw, add hot water to Instant Pot and then add contents of baggie. Cook on high pressure for 15 minutes with sealed valve; then natural release. Let sit for 5 minutes, then slice and add sauce to each serving.